The Make Gahanna Yours Organization Number is 45936. The Kroger Community Rewards program is an ideal way to support your favorite non-profit or charity organization. The program allocates funds to participating organizations based on the purchases that registered members, family and friends of the organization have made at Kroger using their Kroger Plus card. 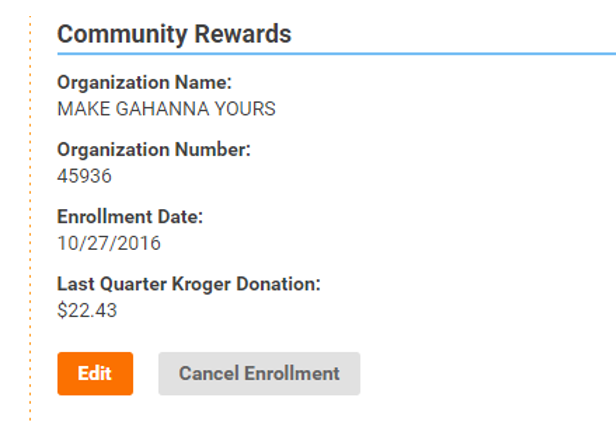 Each individual should enroll their Kroger Plus Card online at the Kroger secure website, http://www.krogercommunityrewards.com and then choose the organization they wish to support. Click on SIGN UP TODAY in the ‘New Customer?’ box (unless you have previously registered online). You will then get a message to check your email inbox and click on the link within the body of the email to finalize card registration. Enter the Make Gahanna Yours NPO number (45936) or name of the organization, select organization from list and click on confirm. If you use your phone number (alternate ID) at the register instead of swiping your card, call 800-576-4377 and select option 4 to get your Kroger Plus card number. You must swipe your registered Kroger Plus card (or use the alternate ID that is associated with your registered Kroger Plus card) when shopping for each purchase to count. When you are finished your rewards account should look like the example below minus the enrollment date and the donation amount.